The RUSA Store should have the Super Randonneur medals available for order by September 15, 2015. It is time again for our annual elections. For a copy of the ballot and to read about the candidates, visit this page.. Please review the online Candidate Statements and use the online ballot to cast your votes. You can also mail the ballot in the American Randonneur. Ballots are due by November 15. PBP 2015 Jersey Again Available for Ordering through September 20! The Randonneurs USA 2015 PBP Jersey and Vest are now available for re-order!! Place your order no later than Sunday September 20th. Your order will ship the week of November 9th. Voler MUST receive a minimum order of 15 items for the items to be produced. If the minimum is not reached, your payment will be returned to you after the order deadline. BTW - the RUSA store has a *very* limited number of Men's M & L jerseys on hand. If you need this size, please order from the RUSA store. No waiting and a low, low shipping fee! The RUSA distance medals (1000k, 2000k, 3000k, 4000k, and 5000k) will not be available until September 2015. Attempting to order them before September 1, 2015 will prove unsuccessful. PBP 2015 Jersey Available for Pre-Ordering! 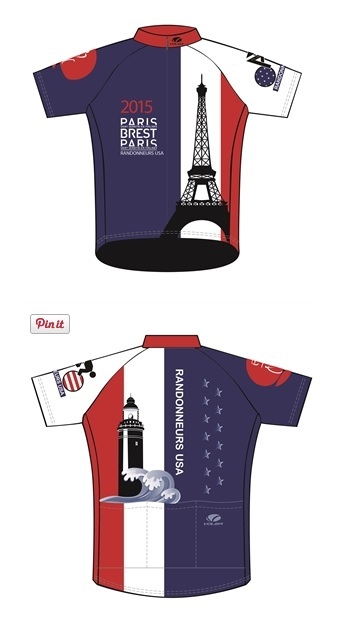 The 2015 Randonneurs USA Paris-Brest-Paris apparel is now available for pre-ordering! Riders can choose from a selection of short sleeve jerseys (men's, women's, club fit, race fit, and zipper length options) as well as a matching Wind Vest. The ordering window will CLOSE on May 25th, so please do not delay. No orders will be accepted after that time. Apparel is NOT exchangeable or returnable, so please read the sizing charts carefully. Apparel will be shipped on July 17th. Randonneurs USA would like to thank Jeff Mendenhall, RUSA #3849, for his significant contribution to the development of this design. Also, thanks to all of the RUSA members who submitted jersey designs. Articles 10 and 11 of the Flèche Rules have been updated, to allow for verification of the 22hr and 24hr controls, in the event of no location of obtain verification at those control points. 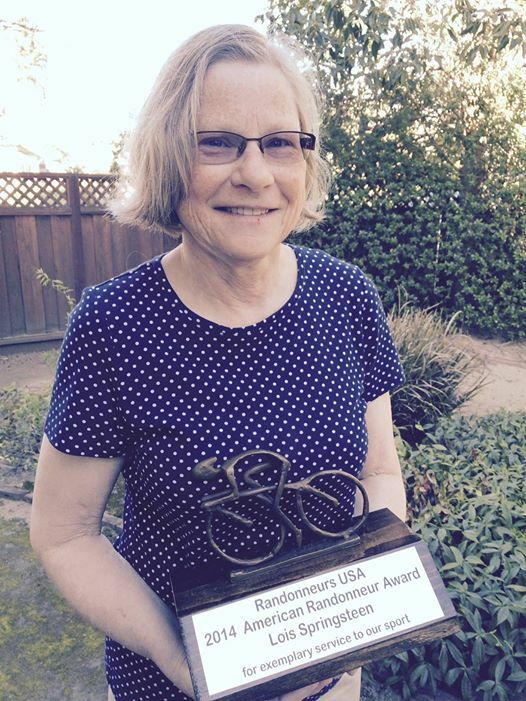 RUSA is pleased to announce that Lois Springsteen is the recipient of the 2014 American Randonneur Award. View a picture here and look for an article in the next issue of American Randonneur. President — Mike Dayton. A North Carolina randonneur, Dayton was re-elected as RUSA's president. Vice President — Rob Hawks. Hawks, the RBA for the San Francisco region, was re-elected as vice-president. Treasurer — Susan Otcenas. Otcenas, a new board member from Oregon, was elected as treasurer. She replaces Eric Vigoren. Secretary — Bill Beck. Beck, a DC Randonneurs member and former RBA for that region, was elected as secretary. The 2015 board will be comprised of Beck, Dayton, Lynne Fitzsimmons, Hawks, Spencer Klaassen (RBA-Liaison), Otcenas and Mark Thomas. The board extends its sincere appreciation to departing Board member Eric Vigoren for his many years of service to RUSA as treasurer. Looking for a new challenge? The ACP Super Randonnée permanent program recognizes riders who complete epic routes with 600 km of distance and at least 10,000 meters of climbing. Organizers of these "SR600K" routes within the US can now opt to submit ride results to RUSA so they are included in member's results and can be used for some RUSA awards. Click here to see the routes that are currently approved in the US.